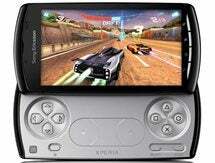 Sony Ericsson unveiled its PlayStation phone, the Xperia Play, on Sunday at the World Mobile Congress. The company hopes it will attract gamers to the well-known Sony brand. The Android-based smartphone will be available to U.S. consumers first starting in March from operator Verizon, with other operators worldwide expected to shortly follow, said Steve Walker, head of Sony Ericsson marketing. Walker said that the Xperia Play finally realizes "the dream of high-quality mobile gaming." As seen on Sony Ericsson's recent Super Bowl advertisement, the Xperia Play has a slide-out game pad, with two analog touch pads, two shoulder buttons, a digital D pad and an area with the four PlayStation icons, which are buttons with a circle, cross, square and triangle. "You keep your hands on controls rather than all over the screen," said Aaron Duke, product manager. More than 50 gaming titles will be available when the Xperia Play launches, including Guitar Hero, Assassin's Creed, Dungeon Defenders: Second Wave second wave and Dead Space. The device will ship with games from the PlayStation one. Sony Ericsson's publishing partners include Electronic Arts, Gameloft, Digital Chocolate, Fishlabs and GLU Mobile/Activision. Electronic Arts will eventually bring its FIFA game to the Xperia Play, which Sony Ericsson said will be the first multiplayer version of that game for mobile devices. Sony Ericsson plans to launch an online game store later this year called the PlayStation Network. It will be a marketplace for games certified by Sony for phones running the Android operating system, said Kazuo Hirai, president of Sony's networked products and services group. In January, Sony Ericsson announced the PlayStation Suite, a framework for moving older games to the Android platform. The Xperia Play has a 1Ghz Snapdragon processor from Qualcomm with an embedded Adreno GPU graphics processor that will play 60 frames per second during gameplay. It has a 4-inch multitouch screen and a 5-megapixel camera. The Xperia Play was perhaps the biggest announcement of Sony Ericsson's lineup at the conference in Barcelona, but the companies also detailed three other phones in the Xperia product line. The three phones – the Arc, Neo and Pro – all run the 2.3 version of Android, called Gingerbread. Sony Ericsson president Bert Nordberg said the companies want to be the leader in Android devices. The Xperia Arc, which features a 4.2-inch screen and the Mobile Bravia display and graphics engine, will go on sale in March, said Cathy Davies, director of global marketing communications. The company's Xperia Neo has an 8-megapixel camera, can record HD video and has an HDMI port. Users can browse through the device's interface using a TV remote control, said Tony McNulty, product director. Other features include the ability to create folders for sorting applications and a pinch function that allows a user to see all of their widgets in one view. Sony Ericsson is pushing the Xperia Pro as a phone for business users. Its e-mail interface allows users to see a preview of the message in the left-hand side. The Pro also has a slide-out QWERTY keyboard.